I hope you all had a wonderful Christmas and New Year’s. We did! I made the girls Pencil Rolls and custom coloring pages for Christmas. They loved the sets. I used Julie 1971 fabric from Spoonflower. Julie 1971, a fabric featuring houses made of felt, is available on Spoonflower. The inspiration for Julie 1971 is a piece of artwork I made when I was 12 years old, in 1971. I made the little felt houses from bits of felt and glued them to the back of a piece of laundry detergent box cardboard. The pencil roll was very easy to make. The lining, pocket and flap are linen, the decorative cover wrap is cotton canvas. Even after all these years, the cardboard is still in great shape. The back of the Felt Houses artwork is cardboard cut from a box of All laundry detergent. My father cut the picture frame from a single piece of wood. The Felt Houses art hangs in our guest room. The original artwork is still vibrant and prints beautifully on canvas and linen fabrics from Spoonflower. Here you can see the original art next to canvas, which I have aged a little by machine washing it in warm water. The pencil roll open, with flap folded over to protect pencil tips and keep the pencils from spilling out during transport. Outer cover – made of a piece of decorative Julie 1971 fabric 17″ x 8.5″, sewed to a piece of linen 17″ x 4.5″ for the flap, to make a rectangle 17″ x 12.5″. The outside of the finished pencil roll, with the flap open. Lining – made of linen cut to 17″ x 12.5″. Pencil pocket – two pieces of linen 17″ x 4″. The cover piece with flap was sewn to the lining piece, right sides together, with a small opening for turning at the bottom. This cover piece was turned right side out and pressed flat. The pencil pocket was made by stitching the two 17″ x 4″ pieces of linen together with a small opening for turning at the bottom. This piece was turned right side out and pressed flat. The pocket piece was sewn to the bottom of the cover piece. Here you can see how simple the pocket is attached to the cover piece. The pocket piece was stitched inside the cover piece at the sides and along the bottom. To figure out where to stitch for the pencil pockets, I simply stuck pieces of masking tape vertically, all across the pocket piece, with a little margin between each piece of tape, and stitched between the pieces of masking tape. Several of the pockets weren’t exactly the same size but that was fine. That method of marking for the pockets was super easy and didn’t need any measuring or marking the fabric at all. To keep the roll shut, I used what I had on hand – stretchy beading elastic tied in a loop. For each girl, I made a custom set of pictures to color. I used Photoshop to alter photographs and printed the coloring pages on cardstock. Some of the coloring pages I gave to the girls. Boxes for pencils are nice, but there is another layer of artsy satisfaction when you unfurl a roll of creamy pencils tucked in soft linen. Here are two free coloring pages for you keep and print out. 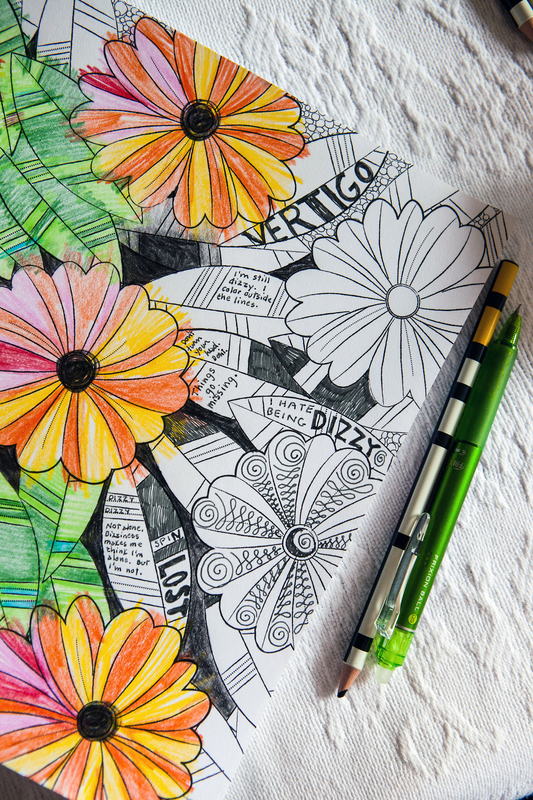 Girl with Flowers in her Hair – a free coloring page for you.